I'm not sure where to even start this morning after watching another game slip through the Blazers' fingertips. Aside from the fact that my office is empty, you can almost feel the quiet in Portland this morning. I'm just not feeling that same energy flowing through everyone's vanes like we had last week. Obviously over the next few days, a ton of work has to be done to overcome a 3-1 deficit which we all know is something that doesn't happen all that often. Maybe another Rip City miracle in the making? And can I just vent for a second? Ron Artest is keeping the Blazers in this series - As much as we all hate Ron-Ron, his horrific play is at least keeping these games close. He shot another whopping 5 of 20 last night while also shelling out 31 points to Brandon Roy. I know this guy is supposed to be "elite" but this is pathetic. Keep it up big guy...along with those bicep poses after making a dinky layup. Shane Battier...go away - If there is one college basketball program that I could drop a bomb on, it would be Duke's. And if it is possible to hate another Dukie more than JJ Redick, Shane Battier is the guy. At least he hasn't buzzed that hair in a while so we're left without having to look at that walnut for another game or so. This is entertainment, but come on Refs - Is it the enormous Chinese audience generating all kinds of revenue for the NBA that's making this such a lopsided foul battle in the post? Is it just Yao Ming's "star factor"? I'm just finding it difficult to understand that 2 guys can total 36 fouls in 4 games while the single guy they are guarding has just 12. Everyone knows that the key to this series is Yao and the dueling 7-footers from Portland, so why is it that these match-ups have been taken from us? On second thought, get over it Portland! - After every blown whistle, all we seem to get is a "WTF?!?!" look from every Portland player. We all understand that the reffing seems to be lacking in the consistency department, but why make it your problem? It's almost as if Joel and Greg are expecting fouls to get called on them now rather than just worrying about playing to their strengths or opponent's weaknesses. It's time to move on, and play with that freelancing aggressive style we saw from this team during the last few weeks of the regular season. Maybe give Batum some run, eh Mac? - All season long, Nic Batum was one of the rocks that this team could lean on for a big play, but now that the Playoffs have arrived, it's like he's been shun to the bench for being young. Why now Nate? Show me the miraculous things that Travis Outlaw has done in this series while logging 3 times the minutes. Aside from an ill-advised three in the closing seconds of last night's game, nothing else is standing out. Aaron Brooks is still Aaron Brooks - He's the exact evil that Steve Blake has never been able to handle. Keep expecting consistent contributions from him, but don't expect anymore 27 point All-Star performances. He'll continue to get his, but the key for Portland remains Yao while forcing guys like Brooks to beat them. Let's just hope the Rockets find some cold patch that lasts for a full week. The offensive glass is no longer Portland's - Finishing the season as the #1 offensive rebounding team in the league means nothing at this point. The Rockets are abusing Portland right now and basically running a clinic on how offensive rebounding wins Playoff series. I will say that Artest bombing bricks from deep isn't helping, especially when he's missing everything so bad that rebounds are coming from free throw line-extended. Enough with the fist pumps - You are scrapping to pull off some solid wins Houston, but enough with the first quarter fist pumps. Just because you are handed unscathed "and-ones" doesn't mean you're entitled to game-long flexing and Tiger Woods-esque fist jabs. Time to start acting like you've been there before...well at least in the 1st round anyway. Just win at home - As fans, all we want is another memorable performance to add to this remarkable season. If you are capable of pulling off the unthinkable, then this town will likely explode, but for now, let's just worry about tomorrow night back home at the RG. We'll be cheering! 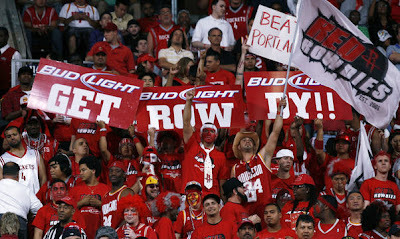 Please Blazers, do the unthinkable, beat the Rockets! I say give Batum the time!! Come on Coach! !